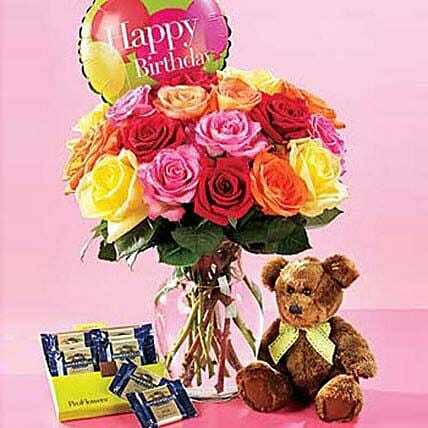 2 dozen of multi colored roses with teddy bear and hershey's kisses 120g added balloon. Available balloon message Happy birthday, Get well, I love you etc. Farm fresh roses arrived in a clear glass vase. Enjoy your flowers! Store your chocolates in the refrigerator.If they are exposed to high temperatures, they may begin to soften, compromising the appearance and flavour.